Prof. Dr. Solveig Richter. Photo: WortMelder, Hochschulkommunikation Universität Erfurt. For years, Dr. Solveig Richter, junior professor of international conflict management (Juniorprofessorin für International Conflict Management) at Universität Erfurt Willy Brandt School of Public Policy in Germany, has been researching the dynamics of armed conflict around the world. For the past year, she has been focusing on the Colombian armed conflict and transition process. In a recent interview with the news portal at Universität Erfurt, Prof. Dr. Solveig Richter shared her thoughts on the present situation of the peace process in Colombia and the work of CAPAZ in this context. Universität Erfurt is one of the ten CAPAZ associate members. The Willy Brandt School of Public Policy, through professor Dr. Solveig Richter and professor Dr. Achim Kemmerling, will represent the university in the CAPAZ Consortium. Dr. Richter highlighted some of the advantages of being an associate member of CAPAZ, including the fact that CAPAZ offers the Willy Brandt School the opportunity to broaden and strengthen the research lines and the academic cooperation network which focuses on conflicts and development in the global South. 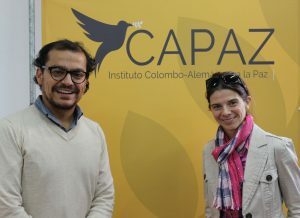 Being part of CAPAZ, gives the school in Erfurt the possibility to develop joint projects and academic events, also render visible the academic and research trajectory of the Willy Brandt School in Colombia and Germany. Universität Erfurt will be even more attractive for Colombian students, professors, and researchers. Richter is open to future co-directorships for MA and Ph.D. theses. Colombia is an important partner for Germany in terms of development and the country has supported Colombia in the peace process. German universities have welcomed Colombian students and continue to do so, while graduates from the Willy Brandt School work in different areas such as research, military careers, German cooperation, or Colombian government agencies for the postconflict. In this sense, there has been an important process of synergies and exchanges. Professor Richter considers that the long Colombian armed conflict has deep running roots and that it covers complex political, social, and economic dimensions immersed in an unequal and culturally diverse society. According to Dr. Richter, the political dimension of the Colombian conflict is about fair land distribution and greater political participation. Many of Colombia’s regions are extremely poor and it is precisely this that led to the foundation of Marxist left-wing guerrillas in the 1960s. With the formation of right-wing paramilitary groups, on the other hand, the armed conflict expanded forcefully as the years went by. The country is also subject to another type of conflict, an economic one, whose criminal violence is motivated by its links with the drugs economy. The signing of the peace accords in 2016, between Nobel Peace Prize winner and former president of Colombia, Juan Manuel Santos and the demobilised FARC guerrilla –one of the country’s biggest guerrilla groups- managed to fence in the political conflict. What we have to do now is to implement the agreements: land distribution, illicit crop substitution programmes, and ways of dealing with the past, among others. What we are dealing with is a broad spectrum of small processes. According to Dr. Richter, the January 17, 2019 attack on the General Santander cadet school in Bogotá –attributed to the Ejército de Liberación Nacional ELN guerrilla– clearly showed that the peace process is, as yet, partial and incomplete. There is, to this day, no agreement and the negotiations with this guerrilla group have been frozen since the positioning of the government of President Iván Duque. It is therefore feared that the country may face renewed military conflict even though the ELN does not have the same military strength as the FARC. Based on her research and following the attack, Richter classifies the country’s situation as fragile and tense, and dependent on the reaction of the government of President Duque. She mentions three aspects to be taken into account in this new context. In the first place, this has been the most serious attack in Colombia for over fifteen years, and one that took place in the country’s capital. For those who felt safe in the capital and believed in the peace process, the attack was a shattering experience, and one of great magnitude compared to previous attacks by the ELN. Many fear the return of attacks and violence. In this sense, this is a setback for the peace process, as is the fact that recent months have witnessed the assassination of numerous social leaders that advocated for human rights, the implementation of peace, alternative development, crop substitution, and the defence of local-level community rights. These civil leaders are under constant threat. Second, the conflict with the ELN may lead the Duque government to strengthen its security policy and direct it towards military confrontation. The Colombian society fears a new outbreak of military confrontation with rebel groups, with less protection for the population in all regions and, therefore, a reduced capacity for the implementation of the peace process. This “securitization” would constitute an enormous threat to the incipient peace process and the cost would be borne by the civil population. Finally, we cannot underestimate the international dimension. The ELN is a left-wing guerrilla group and is, obviously, supported by Venezuela. A military confrontation with the group may quickly reach a dimension of conflict between states. In Colombia, CAPAZ has become a central and very active actor, thanks to its activities and events surrounding the peace process. The Institute acts as a bridge between academia and civil society through the participation of partners in many projects developed around the country. Professor Richter explains that current events are framed directly within the debate regarding the projects and studies developed. For example, the recent ELN attack in Bogotá is related with the projects that inquire into the state of the negotiations or conversations with this guerrilla group. Another example is the project currently directed by Richter involving the reintegration of the former FARC guerrilla into Colombian society, whereby those that support this investigation inform Richter about the former combatants’ current fears and uncertainties with respect to a possible stagnation of the process. A single death in conflict is one death too many, states Richter. The attack revealed how fragile the peace process still is. Unfortunately, research into conflict has shown that it is precisely in the first years following a peace agreement that there is an increase of civil wars. But Solveig Richter is hopeful. Many members of government, civil society, and academia want to actively persevere with the peace process in Colombia. In this context, Professor Richter extends her invitation of participation to those interested in the topic or those who want to bring forth ideas for projects and activities. 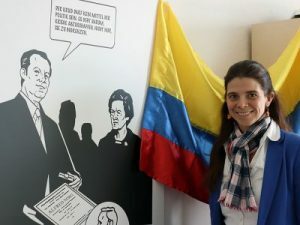 From the Willy Brandt School, Professor Solveig Richter and the team of collaborators seek to establish themselves in Erfurt and its surroundings as a platform promoting research into Colombia and its peace process. This is not a closed circle; all those who, based in academia, wish to take part in the Colombian peace process are welcome to do so. Read the full interview with Prof. Dr. Solveig Richter: “The tender plant of peace is under threat” („Die zarten Pflänzchen des Friedens sind bedroht“, in German).